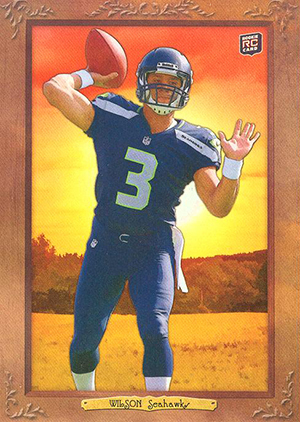 2012 Topps Turkey Red Football is another limited edition online exclusive. Offered initially only on Topps' online shop, the release focuses entirely on rookies. Every box comes with 11 cards including an autograph. The 2012 Topps Turkey Red Football base set has 100 cards. All are rookies, meaning it goes deep into the 2012 first-year class. Top names like Andrew Luck, Robert Griffin III, Alfred Morris and Russell Wilson are all on the list. Base cards have a mini parallel, which are inserted one per box. These cards measure 2.075" by 2.905". Printing plates are also randomly included in the product. 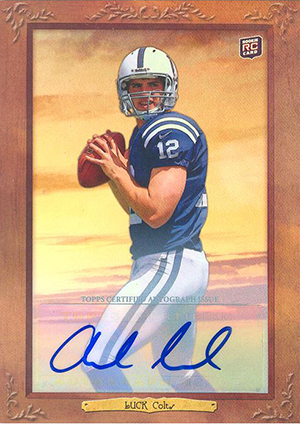 More than 50 rookies also have autographs in 2012 Topps Turkey Red Football, including Luck, RG3 and Morris. Autographs use stickers for the signatures and have Red parallels that are numbered to 10. Regular autographs are also numbered, although to differing amounts. 2012 Topps Turkey Red Case Keenum Red Auto RC 02 10 Rare! Click here for a complete visual guide. Cards are numbered to varying amounts. Confirmed print runs noted next to individual cards. No list of the rookies is a panini move. dexter � Not sure what you mean. All the cards in this set are rookies. Excellent Product for the price point. I opened 5 boxes and got 1 printing plate, 2 Andrew Luck, and 1 Robert Griffin III. I think these boxes give a return on your investment for the price point. My 1 complaint. The boxes need a lip inside to hold the packs still and prevent them from rattling around in the box.